SWAN analyzes whole genome sequencing data sets to identify structural variants. 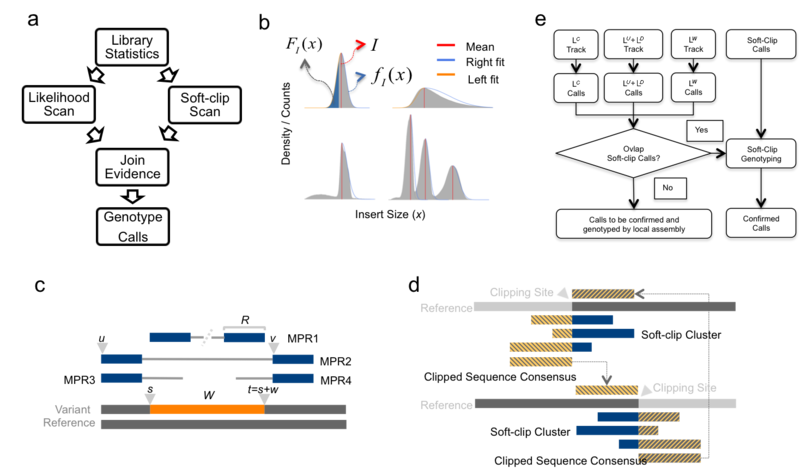 SWAN currently supports shot-gun whole genome sequencing data from Illumina platforms. SWAN takes as input the BAM file output of BWA aligner or others and outputs a list of structural variants in BED/VCF format. SWAN's modeling and pipeline are illustrated in Figures 1. Figure 1. The principle and workflow of SWAN. SWAN is an RcppArmadillo package. It works OS platform independently (through Docker). It installs on Linux (tested for Ubuntu). It might also install for Mac (with Macports and Homebrew) and Windows (with Cygwin). However, these were not tested. # If you have "-lgfortran" or "-lquadmath" not found problems from above commands, please see entry in FAQ for fix. It mostly affects Ubuntu<=12, where the libgfortran link is often broken. # now if you have "Error in unloadNamespace(package)" after "preparing package for lazy loading", please see entry in FAQ for fix. It is most likely R sessions haven't finished updating packages, try reinstall SWAN with a new Shell and R session some time later and it will self correct. # now if you see warnings or errors during installation of any above packages, try the above two steps again and it usually self resolves. After installation, please do a sanity check for and learn the usage of single or paired sample analysis pipelines. If the executables were moved to other places and the user has to update $SWAN_BIN and $PATH accordingly. Use '-h' to read script-wise usage.